Liquor is any alcoholic drink containing ethanol and produced by distilling. They are also called distilled beverages. 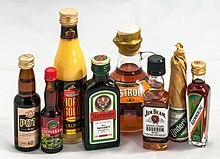 The term hard liquor is used around North America and India to tell distilled beverages from those that are weaker. If the beverage carries no added sugar or has at least 20% alcohol by volume, it is referred to as a spirit. Alcoholic beverages are under different regulations around the world. This page was last changed on 22 September 2017, at 15:06.